The flu isn’t playing around. Experts say it’s been particularly severe, with more than 60,000 Americans testing positive for influenza since Oct. 1 (and that number will keep rising). Why is this flu season so rough compared with some others? It all comes down to the type of flu that’s spreading, according to Margarita Rohr, a clinical instructor of medicine at New York University’s Langone Health. Given that, the first signs of the sniffles might induce panic. 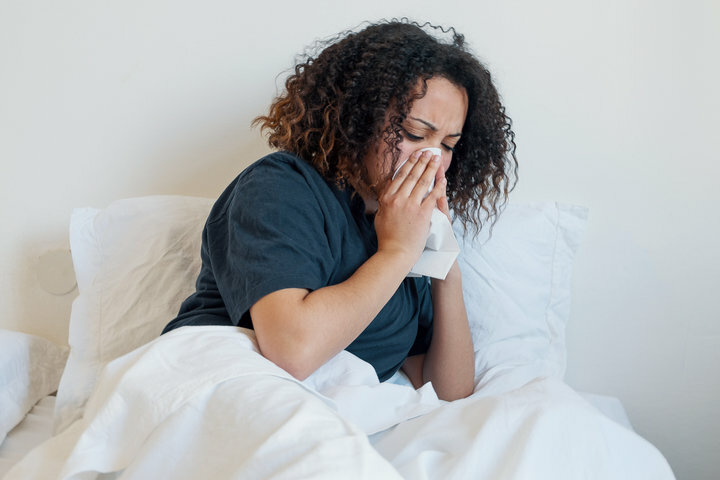 But there are distinct differences between a run-of-the-mill cold and flu symptoms, and there are ways to manage both to get you feeling better as soon as possible. Below, experts break down the warning signs that distinguish whether you’re dealing with the flu versus a cold, plus tips on how to nurse yourself back to health. Flu symptoms are typically more intense. A cold and the flu have symptoms that overlap, such as a sore throat, fever, cough, headache, congestion, sneezing. However, the severity of the symptoms is usually what sets the flu apart, Rohr said. Flu symptoms also appear quickly. If you feel fine at the office and suddenly feel sick when you walk through your front door, chances are you might be coming down with the flu. 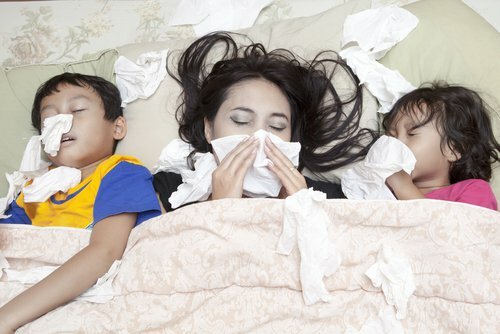 Colds usually take a little more time to develop, according to Ian Tong, chief medical officer at Doctor On Demand. “You can go from well to sick within just a few hours [if you have the flu],” Tong said. Symptoms may start with a cough but then will rapidly progress to a high fever, body aches and fatigue, he said. Your body will feel more run down with the flu. Are you feeling under the weather but could force yourself to go to the office? You’re probably dealing with a cold rather than the flu. See a doctor for a prescription ASAP. There are treatments for the flu through prescriptions like Tamiflu, an antiviral medication that may reduce the length of the illness. But you have to act fast. “The treatment window for flu is usually within the first 48 hours of the onset of symptoms,” Tong said. Congratulations, your bed is now your new best friend. Stay hydrated and eat good foods. This goes for the flu or a common cold. You tend to get dehydrated due to fever sweats or lack of appetite, Tong said. Use home remedies to help ease your symptoms. Items you already have on hand in your medicine cabinet or at home may help abate some of the nasty side effects of your illness. Seek additional medical care if the symptoms become too much. The flu makes you more susceptible to other illnesses, like bronchitis, pneumonia and sinusitis, according to Rohr. If you’re experiencing chest pains, dizziness or difficulty breathing, it’s best to seek a health professional right away to make sure something more severe isn’t occurring, she stressed. It’s also important to monitor your fever, keeping a close eye on major spikes as well as the actual temperature. A high fever of up to 103 or 104 degrees Fahrenheit, a rapid heart rate or shortness of breath shouldn’t be ignored, Tong said.